Prayers are Groups A & G: (See https://remnantdisciplesjtm.com/crusade-prayer-group-format/ for details). Then Herod called the magi secretly and ascertained from them the time of the star’s appearance. He sent them to Bethlehem and said, “Go and search diligently for the child. When you have found him, bring me word, that I too may go and do him homage.” After their audience with the king they set out. And behold, the star that they had seen at its rising preceded them, until it came and stopped over the place where the child was. 10 They were overjoyed at seeing the star, 11 and on entering the house they saw the child with Mary his mother. They prostrated themselves and did him homage. Then they opened their treasures and offered him gifts of gold, frankincense, and myrrh. 12 And having been warned in a dream not to return to Herod, they departed for their country by another way. Who amongst you, who truly honours Me and follows My Teachings, can humble themselves before Me without any regard for themselves? If you can throw yourselves at My Mercy, in humble servitude, I will raise you up and exalt you. But when you exalt yourselves, in My Name, and say you know Me more intimately than others, I will cast you to the ground beneath My Feet. 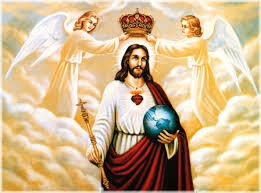 Those who claim that they are dedicated followers of Mine, but who believe that they are qualified to judge others, analyse the beliefs of others whose faith in God causes offense and who publicly condemn holy souls who come in My Name, are not part of My Kingdom.You belong to the evil one, for you do not report to Me, Jesus Christ. I have not called you, nor have I given you permission to promote any form of special group, set up to ridicule another group. So few of you will accept My plan to prepare you for the Second Time of My Coming – this time to bring you into the New Era of Peace. You already know the Truth. You know that I will come again, but you will not, just as it was before, accept that it is I, the King of all that is, Who is calling on you to prepare your souls. I Am simple in mind, body and soul, and therefore embrace first, those who come before Me in this way. When a father welcomes home a child, who has been abroad for some time, he does not notice his clothes, his shoes, his jewellery or his suitcase. He sees only his son, his face and the love that has existed in his heart since the first breath he took when he came out of his mother’s womb. He is not interested in his wealth, his views, his opinions or his gossip about others – all he knows is the love, which he feels for his child and the love his child feels for him. Never be disillusioned with the trials you endure. Accept them, for what they will offer you – strength of mind and soul. Then you will lead My children to the end times with humility, dignity and strength. Be brave now. I Am guiding you. Turn now and pray for extra graces to make you stronger in your Divine Mission.